Waiting in the hostel lounge this morning for the car rental company to pick us up was pure torture! Not from impatience (even though matey was 2 hours late picking us up) but from the smell and sound of cooking bacon. Someone in the adjoining kitchen was, by the sound of things, cooking up a storm. Not good when you are hungry and cannot taste the end result! Having inhaled our fill of bacon, the car rental guy eventually rolled up and put his delay down to traffic congestion. Perhaps a reasonanble explanation in some cities but with a population of 3.9 million people in the whole of New Zealand, making that 14 people per square kilometre, and the fact that this is the beautiful tranquil town of Christchurch, me thinks he hadn't set his alarm clock last night! Still, we were in no hurry and didn't make a fuss about this. "Why is it that everytime you are hungry, there is always someone cooking bacon around you? ", I commented to the car rental guy, "It simply shouldn't be allowed!". At this point, he divulged some local knowledge, "Ah, there is an excellent pie shop next door to our premises". Smashing, it was nearly lunchtime afterall! Matey put on the kettle and off we went next door. The pie shop had a lot more choice than I was expecting. As well as the standard meat pies you'd normally see, there were a few extras including chicken satay, sweet and sour pork, turkey and cranberry, goat and blue cheese, jugged hare and port, emu etc. Pie shop? More like a cross between a trendy café and a bakery! Once the pies had been eaten and paperwork completed, we headed out of town in our two-berth campervan. Don't tell Ethel this (Ethel is our 1975 VW Kombi who is still hanging around in Sydney) but this van is well set up for travellers. There is a sink, gas stove, fan heater and all the cabinets doors have great locking mechanisms that secure everything in nicely, stopping the odd tin of Ravioli from rolling out on those harsh bends. We headed west, through the mountainous region of Arthurs Pass. The road we took almost ran parallel to the TranzAlpine train route, connecting Christchurch to the west. Impossible to capture on any medium, other than seeing it with your very own eyes, is the sheer height of these mountains (the highest peak being Mount Murchison at 2,400m). Needless to say, we kept taking photo stops along the way. Rocks at Panukaiki, West Coast. We arrived at Punakaiki just in time for sunset. 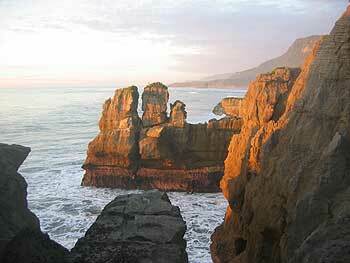 Punakaiki is well known for the Pancake Rocks and Blowholes. 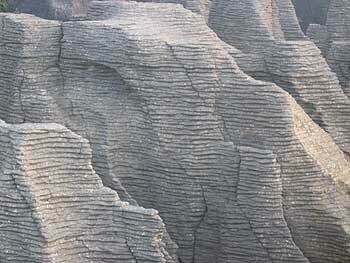 Limestone rocks have eroded into what looks like stacks of thin pancakes. Every now and then, when the waves came crashing in through the caverns beneath these rocks, water would be squirted out through blowholes. We didn't actually get to see this at high tide when the blowholes would apparently, look geyser-like. 'Basically we open at about 8am but sometimes as late as 9 or 10am or sometimes not at all. Usually we close about 6 or 7pm but sometimes as early as 3 or 4pm or as late as 11pm. Some days we don't open or some afternoons but lately I have been here most of the time except when I have been away'. Now how can you argue with that? !